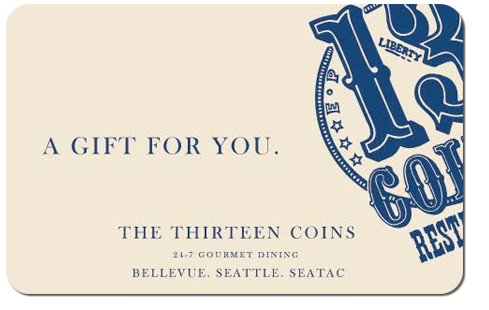 Give the experience of 13 Coins’ legendary food, surroundings and service. Good at any of our locations, your gift card is the perfect present for friends, family, business associates and those en route to and from Seattle Tacoma International Airport. Choose an amount from the drop-down list below. You may also phone (206) 382-1313 for immediate gift card assistance.